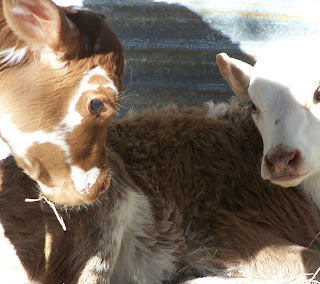 Bottle Feeding Baby Calves: Why does my calf poop stink really bad? Why does my calf poop stink really bad? I am not saying that calf poop normal smells good, but there are those times when it really smells bad. Like something died. This is actually a very serious condition. Rancid smelling poop in calf is an indication that it is not digesting it's intake well. Most of the time you will notice this in bottle calves, and a few novice with bottle calves will think it has something to do with type or brand of milk replacer. Somehow the milk replacer is not agreeing with the calf's stomach. It is not true. Something is going on. Attempting to change or go to a different brand of milk replacer won't help the problem. The calf's intestines are infected by a bacteria causing damage and poor nutritional absorption. E coli is common but also one of many bacteria that could be the problem. Active charcoal or charcoal can help in most cases. But the problem is if you administer antibiotics you going to low the effectiveness of the antibiotics. I use a two step treatment method that has worked extremely well for my calves. The first part is to give antibiotics and the next is to substitute milk replacer feeding with a different product for a few days. It is also important not to allow them water during this treatment time. In my guidelines for raising and caring for calves the treatment use for scouring calves is the exact same treatment.